There’s cafes and then there’s Caffè Nero cafes. The distinctive Italian vibe and laid-back atmosphere in a Caffè Nero is guaranteed to provide a great place to start your weekend, or work if you want a break from the home office. Fresh coffee beans from Latin America, East Africa, and Southeast Asia are ground on the premises and are always served with a smile from your barista. If you’re more of a coffee connoisseur, and like to do your brewing at home - you’ll be nicely surprised to hear that Caffè Nero sells a vast array of coffee paraphernalia including: Aeropress Filters, Chemex Coffee Makers and Toddy Cold Brew Systems. If you have any coffee-obsessive friends who are difficult to buy presents for, why not think about getting them a Caffè Nero gift card? For the utmost in personalisation - Caffè Nero offers a diverse range of gift cards with beautiful designs from V&A art collections, and others with inspirational written quotes from Penguin Classics. Simply pick the design, set a value amount and have the card delivered to their home within three days. How do I use my Caffè Nero voucher? Redeem your voucher in store for free coffee, discounts and much more depending what's on our coffee menu! 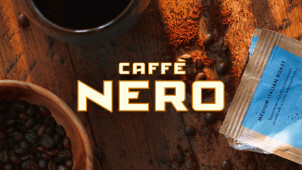 Download the Caffè Nero app and start getting virtual stamps on your loyalty card. Earn rewards to spend on your favourite drinks and food at Caffè Nero. What should I do if I’ve lost something in a Caffè Nero store? Contact the store you left the item in to see if a barista has stored it in lost property. Is there nutritional and allergen information for Caffè Nero products? Yes, you will find all this info on the Caffè Nero website, in a drop down box next to each product. You can call Customer Services if you need further clarification. Is it possible to top up Caffè Nero gift cards? Yes, you can top up in-store or online. You can add up to £200 credit on it. When you order products online, you are charged a flat shipping rate of £5. You can arrange for items to be delivered to your home or someone else's home, if the item is a gift. Simply explain any additional requirements in the ‘order notes’ box on the checkout form. If you wish to make a complaint or wish to return an item, you should email the complaints department of Caffè Nero, and state your order number when you write. Check the Store Locator to find specific store opening times. If nothing makes you happier than when you’re sipping a freshly poured flat white while watching the world go by, then head to Caffè Nero, pronto. Use a Caffè Nero voucher to treat yourself to a rich and aromatic coffee that is sure to give you a little lift whether you're on your way to work or enjoying the weekend. There’s an Italian kick in every latte and cappuccino, while Caffé Nero also serves the most decadent of hot chocolates, cold coffees and frappés too. Perfect for kids and adults alike with delectable snacks and afternoon treats to suit all tastes, that's why Caffé Nero is a real coffee house crowd pleaser..
Caffè Nero works directly with coffee farmers in Latin America, East Africa, and Southeast Asia to ensure that the producers get the fairest deal and so that Caffè Nero can be absolutely certain that it gets the finest coffee beans for its customers. Caffè Nero also works with the Rainforest Alliance on the certification of the beans. The main aim is to encourage sustainable livelihoods for farmers, while supporting communities and the environment where Caffè Nero coffee is grown. We love a good latte, and whether you like yours steaming with oat milk or poured over ice - find your Caffé Nero offer to save on this classic favourite drink today. Choose a latte with skimmed or soya milk for a lighter kick, while if you’ve got a bit of a sweet tooth, you could add extras like a flavoured syrup. Go vanilla, caramel or choose another favourite extra off the coffee menu, you can make your latte yours.